The work depicts a “building designed in imitation of the ruins of a church or chapel…intended to be placed, as those houses generally are, by the side of a piece of still water…or built by the side of a river… in a retired part of a gentleman’s estate, who farms his own land, and has an extensive dairy-farm under his own direction, and who would build it to be at one and the same time an object of attraction to his visitors, as well as a place of residence for the person entrusted with the super-intendance of the dairy. Though the outside of that part of the building which constitutes the supposed chapel is meant to bear the appearance of the dilapidations of time, the inside is intended to be handsomely finished with Gothic decorations. The spot is surrounded by higher ground, whence a spring issued, and as a cascade, fell into the lake, on the margin of which building was proposed to stand,” (J. Papworth, Hints on Ornamental Gardening 69). Papworth was accepted into the Royal Academy in 1798. In 1834 he helped found the Institute of British Architects. Between these times, he built and designed several architectural works throughout England, including garden buildings, houses, estates and palaces (A. Cates, “Papworth, John”). The work depicts a “building designed in imitation of the ruins of a church or chapel…intended to be placed, as those houses generally are, by the side of a piece of still water…or built by the side of a river… in a retired part of a gentleman’s estate, who farms his own land, and has an extensive dairy-farm under his own direction, and who would build it to be at one and the same time an object of attraction to his visitors, as well as a place of residence for the person entrusted with the super-intendance of the dairy. Though the outside of that part of the building which constitutes the supposed chapel is meant to bear the appearance of the dilapidations of time, the inside is intended to be handsomely finished with Gothic decorations. The spot is surrounded by higher ground, whence a spring issued, and as a cascade, fell into the lake, on the margin of which building was proposed to stand” (J. Papworth, Hints on Ornamental Gardening, 69). The beautification of gardens and outdoor areas was a favorite pastime and profitable business in the eighteenth century. 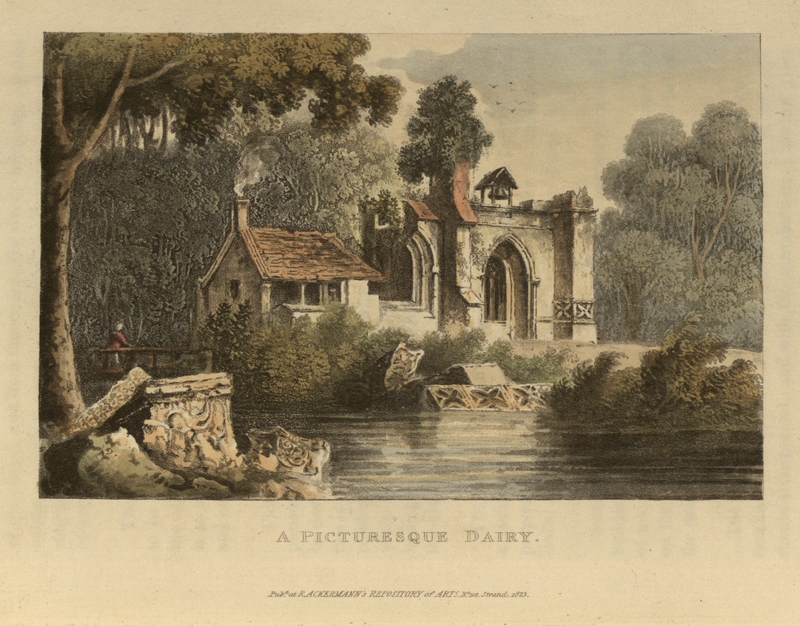 John Papworth’s depiction of a "Picturesque Dairy" demonstrates the invasion of ruins even into the world of gardening and landscape design. The fascination with and fashionableness of a building in a ruined state are characteristic of the romantic period. As seen in this work, created ruins, based off of actual sites of ruins, were used to decorate and add charm to a garden (J. Brown, English Gardens) . This exemplifies the ubiquity of ruins as an integral aesthetic element of Romanticism. Brown, Jane. Art and Architecture of English Gardens Designs for the garden from the collection of the Royal Institute of British Architects 1609 to the Present Day. New York: Rizzoli, 1989. Cates, Arthur . “Papworth, John Buonarotti (1775–1847).” Rev. John Elliott. Oxford Dictionary of National Biography. Ed. H. C. G. Matthew and Brian Harrison. Oxford: OUP, 2004. Online ed. Ed. Lawrence Goldman. Jan. 2008. 20 Apr. 2009 . David Prout. "Papworth." Grove Art Online. Oxford Art Online. 2 Apr. 2009 . Papworth, Wyatt. John B. Papworth: A Record of his Life and Works. London: Oxford University, 1879.